This is a digital archive of candy packaging and related ephemera that I’ve been building over the past five years, on my Flickr pages. It’s the result of hundreds of hours of work, and is over 2,000 hi-res scans and images strong. It’s also what led to the site you are now on. Please drop by and check it out. Darlene Lacey has been collecting candy longer than anyone I know, and her website shows the depth of her appreciation for the material. If you dig candy wrappers and boxes, and if you’re here you probably do – go check out her site. It’s lovingly designed and organized, and has long been one of my very favorite spots on the web. Beyond just a place to look at wrappers, Darlene shares insights into the history and development of select brands – she’s an exceptional curator. So it’s a wonderful site to visit for anyone who has ever enjoyed a piece of candy. CerealBits.com – The cereal box collecting forum. Launched just over five years ago, CerealBits is the best place to go for the discussion of cereal box collecting. It’s also got a discussion group for collectors of Candy & Gum, and other vintage packaging categories. It’s a great place to ask questions and meet other collectors of vintage packaging. Martin Mihal of the Czech Republic has been collecting chocolate wrappers since 1989. Having collected wrappers from around the world for over twenty years, his collection stands at over 100,000 chocolate wrappers – an astounding feat. Martin’s website started in December of 1999 and currently hosts about 20,000 wrappers scanned from his collection. Brad Kent’s site is another one that I’ve been visiting for many years. Brad has an encyclopedic assortment of wrappers, mainly from the last 20 years, nicely organized. You will see a lot of things here you can’t see anywhere else. Updates are pretty regular. A relatively new site, launching in 2009, it has nonetheless been a steadily growing spot to see wonderful scans of both new and vintage wrappers. With classy presentation, and a Smithsonian approach to preservation, the site does a fantastic job of preserving and adding to the known history of candy packaging. A treasure trove of images! Mike’s Candy Wrappers pages is another one that’s been around for a few years. Unlike my fellow collector’s sites, Mike throws his wrappers away, right after he’s done scanning them. He’s just documenting what he eats. Mike also has a lot of great images of wrappers from the last decade that you might not find anywhere else. Dan Goodsell’s original site, theimaginaryworld.com, and his book Krazy Kids Food, were an early inspiration for my hobby pursuits. Though you can find updated images of his collection of candy and more on his Flickr pages, this is still a great spot to see an assortment of candy and other fun packaging images. Not a collecting site, but even so, Cybele May’s CandyBlog is a great way to stay up on new releases and new trends in candy. 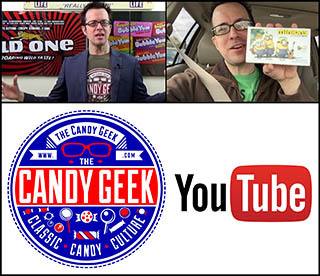 Unlike CollectingCandy.com, CandyBlog actually talks about the contents of the wrappers and boxes – the tasty contents that the packaging is created for.